The State University of New York (SUNY) at New Paltz was founded in 1828, and in homage to the Huguenot (French Protestant) founders of the city, five dormitories and a dining hall were named after them. Each one owned slaves. 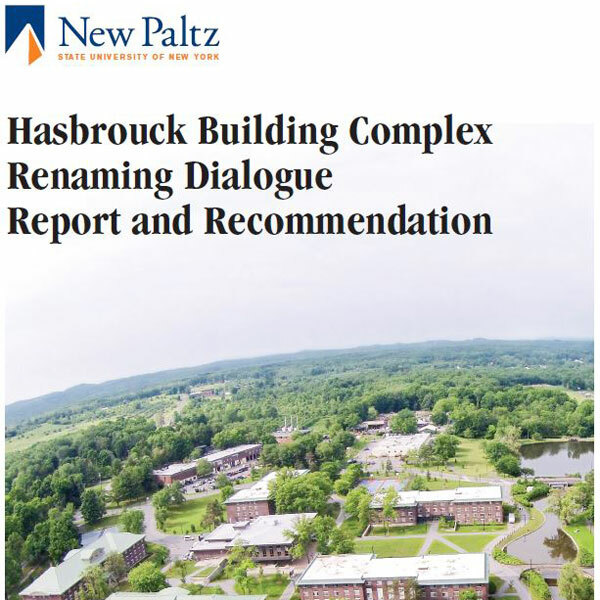 Henceforth, however, the buildings will bear Native American names that reflect regional geographic features (Shawangunk Hall, Awosting Hall, Minnewaska Hall, Mohonk Hall, Ashokan Hall, and Peregrine Dining Hall). The renaming effort comes in the wake of widespread campus discussions, spurred by the white supremacist violence in Charlottesville, Virginia, in the summer of 2017. That fall, SUNY New Paltz president Donald P. Christian initiated a conversation that led to last month’s vote to change the names of the buildings. Some appreciate the change, like SUNY’s board of trustees; H. Carl McCall, a former state senator and comptroller who was New York’s first black candidate to be elected to statewide office; and N’della Seque, a 21-year-old senior and the president of the student association. The statements of opposition coming from the scions of the town’s founders bring to mind a number of quotes from Dr. Martin Luther King, Jr. In particular, “Every man must decide whether he will walk in the light of creative altruism or in the darkness of destructive selfishness.” As a sector committed to social change, it is important not to separate ourselves from those who are being marginalized or done a disservice, but to identify with them. Getting to know their day-to-day lives and their history, empathizing with them, will allow us to better advocate for them. Going strictly by our personal version or understanding of history will benefit only us—not those whom we serve, and not the community as a whole. Diandria has many years of experience working within the private and public sector. She received her Bachelors of Science degree in Chemistry from Spelman College. Diandria went on to pursue a Masters of Public Health from Walden University and a Masters of Public Administration from the University of North Carolina at Chapel Hill. She also holds a Graduate Certificate in Nonprofit Management and Social Enterprise from Georgia State University. Diandria currently acts as a nonprofit consultant working with nonprofits in the areas of board development, fundraising, grant-writing, and internal processes and culture development. She believes in helping individuals and organizations fully and confidently walk in their purpose, and getting them to the next level. A leading national health foundation announces it will no longer give awards honoring sports teams foundations if their teams have mascots that perpetuate stereotypes of American Indian and Alaskan Native people.